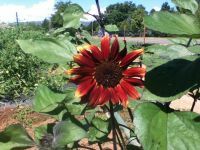 If you and a group are interested in visiting the farm, please call Bob Miller at 970-443-4011 to arrange a time and date for the tour. September and early October outings are best as children can see some crops still growing, see other crops coming to the end of their lifecycle, get a pumpkin, and maybe eat some delicious watermelon as the season allows. This time of year is also cool enough that children will be comfortable during the farm tour. Groups of 10 or more individuals cost $25 which covers the farmer's time, a pumpkin or gourd per person, and any goodies consumed on site--melons, carrots, etc.